One of the fascinating things about the natural world is that no matter how knowledgeable you think you are, what you don’t know will always far outweigh what you do. An offhanded comment by my friend Josh recently about “foraging mallow” was a telling example of this. When Josh said this, I played it off like “oh yeah, I know.” But while I knew that mallow was edible, and I was kinda sure it was what I grew up calling cheeses (the seeds look like little wheels of cheese) this was the sum total of my mallow knowledge. Little did I know that the Eastern Mediterranean — Greece, Turkey, Syria, Israel, Egypt — loves this plant. Mallows are mostly a stewing green, as the leaves are a little fuzzy, which can be off-putting if you eat them raw in a salad (but hey, if you like eating fuzzy leaves, knock yourself out). Incidentally, the best source for mallow recipes, as well as a host of other unusual Mediterranean green things, is Paula Wolfert’s Mediterranean Grains and Greens. As I did more research, I found that in Morocco, they cook the hell out of mallow and other greens to make a green sludge (Chez Panisse apparently made it once, calling it “herb jam.” Gotta love marketing!) that is spread hot on crusty bread. Saveur has a version of this recipe. In the Piedmont region of Italy, it is chopped and added to that pan-European dish, the pureed green thing-potato-onion soup. I’ve seen scores of versions of this sort of soup, often with nettles. Here is my version, which uses borage. 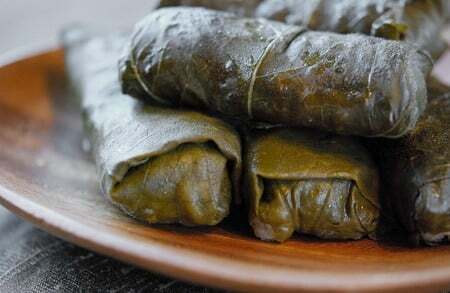 Several other Turks said they use large mallow leaves as wrappers for dolma, which the Greeks call dolmades, most of us call stuffed grape leaves and which I call massively addicting. I’ve eaten whole cans at one sitting. So I set out looking for these mallow plants, because I love me some dolma. As I typically do, I started by looking in my backyard, where I found a bunch of mallows growing — but they are the variety with smallish leaves; these are best for a mixed green saute or stew. 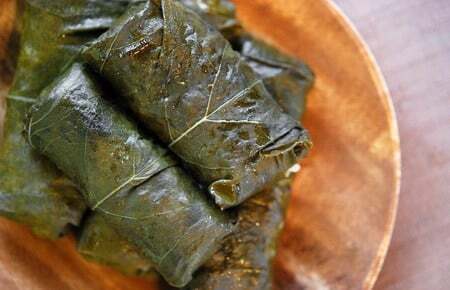 What I wanted was the gigantic mallow leaves I’d heard were used to make dolmas in Turkey. Josh wanted to go foraging for them, too, and we immediately decided this would be the easiest foraging trip ever. For those of you who live in Sacramento, you will know why: It grows EVERYWHERE along Highway 50. Giant, four-foot monsters with huge wide leaves. So Holly, Josh and I set out in search of mallow. We came up empty. Damn. So we got onto Highway 50 and debated. Do we really want to pick mallow alongside a highway? Pesticides are an issue, but there is enough mallow growing far back from the side of the road to avoid the sprayers. The other issue is exhaust. I seem to remember reading that plants growing near highways can pick up some heavy metals from the exhaust — anyone whose done research on this, please chime in! We were wary enough to cut only a little. Still, it was a weird environment for foraging. I think my advice would be that it is OK to use a little of these roadside plants, but don’t make a habit of it. If you can find them off the beaten path, go for broke. 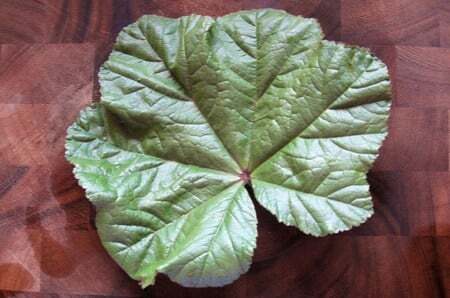 Once we had the mallow home, I preserved the leaves for stuffing. 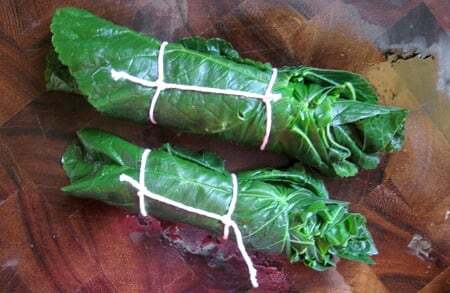 You do this the same way you would preserve a grape leaf: Boil in salty water for a minute or two, shock in an ice water bath, let drip dry for a while, then roll up sideways and tie with string. To preserve them, mix 1/4 cup of lemon juice, a splash of vinegar and a quart of water with 2 tablespoons salt and boil it. Stuff the wrapped leaves into a Mason jar and pour the hot mixture over them. Seal the jars and process in a boiling-water bath for 15 minutes. Or keep in the fridge. What to stuff the mallow with? 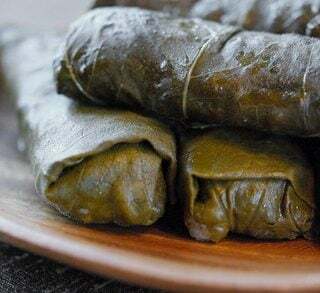 There are hundreds of dolma recipes on the web. Some “authentic,” some modern. Basically the only thing I can tell you is that you can use whatever the hell you want. My only caveat to such license is that if you use rice, you must use short- or medium-grained rice. Long-grained rice sets up hard when you eat it cold; it’s like eating twigs. This particular filling came together from some random things I had in my house at the time. Onion, some mushrooms, and a batch of arugula pesto I’d made a few days before. I mixed this with half-cooked short-grain rice and went to town. The use of short- or medium-grain rice is vital — if you are using rice. Long-grain rice tastes terrible cold. As for the arugula pesto and hedgehog mushrooms, I know they are pretty esoteric, but this recipe would be just fine with regular pesto and any nice mushroom, chopped fine. Go for wild ones if you can get them, but even the little brown cremini mushrooms would be good. Get a large frying pan hot over high heat. Add the mushrooms and shake the pan often until they release their water. When most of the water is gone, add the onion and the olive oil and a little salt. Toss to combine. Saute this over high heat until the onion begins to color, then add the rice. Toss to combine. Toast for a minute, then add 1 cup of water and a little salt. Turn the heat to medium and let the water cook away. When it is absorbed, turn off the heat and let the rice cool. Add the pesto and toss to combine. You can add a little olive oil if you have a dryish pesto. Grape and mallow leaves come in different sizes, so adjust the amount of filling as needed when you fill them. It should always be about a tablespoon, though. Line up your dolmas seam side down on a perforated vegetable steam insert, Chinese steamer or even on the bottom of a pan. Nestle them in snug against each other, and it is OK to stack them up to three levels high. 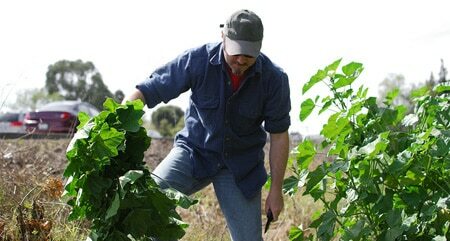 Mallow leaves don’t need to be weighed down, but grape leaves benefit from it. Lay a plate over the dolmas when you put them in to the pot you are about to steam them in. I use a large stockpot. Put in enough water to come up just under the level of the dolmas, cover and bring to a boil. Steam gently for 40 minutes to an hour — why the difference? Depends on how fresh your rice is, and how much water it soaked up initially. Better to err on the long side than the short, as no one likes crunchy rice. Serve warm or at room temperature. Dolmas will keep for a week in the fridge. To fold the dolmas, you lay the leaf smooth side down, bottom facing you. Put about a tablespoon of filling in a little log alongside the bottom, stretching from side to side toward the leaf edges. leave at least a half-inch of space on either edge. Fold up from the bottom once, then fold over the sides and roll up. It takes some practice, as you will learn how much tension you can put on the dolma before the leaf rips. Aside from being edible, mallow is fantastic for compost, so throw whatever you don’t use in the compost pile or just drop in on the ground as mulch (before it starts to produce seeds, unless you want a lot more). The deep tap root collects lots of nutrients and brings them up into the leaves. Also great to feed to other animals like chickens, goats, pigs, horses, etc. I first learned about eating the immature seeds, which taste a little like green beans. Fun but time consuming to harvest. The young, small leaves are the most tender for raw eating and not as fuzzy. Thanks for the great article and all the comments. When I’m eating something I think might be a source of heavy metals, I like to throw something selenium-rich (e.g. brazil nuts) into the mix. Selenium has been shown to help mitigate exposure, reducing levels of mercury (hello, ocean fish), arsenic, and other toxic compounds. Foraging from the roadside is definitely not a good idea. As you stated the roadside exhaust and chemicals get picked up by any vegetation/ mushrooms growing in concreted amounts.